The talented rookie defenseman is out at least four weeks because of a sprained MCL. BOSTON — They survived long stretches without Brad Marchand, David Krejci, David Backes, Noel Acciari and Adam McQuaid, and got by without other injured players for shorter stretches. 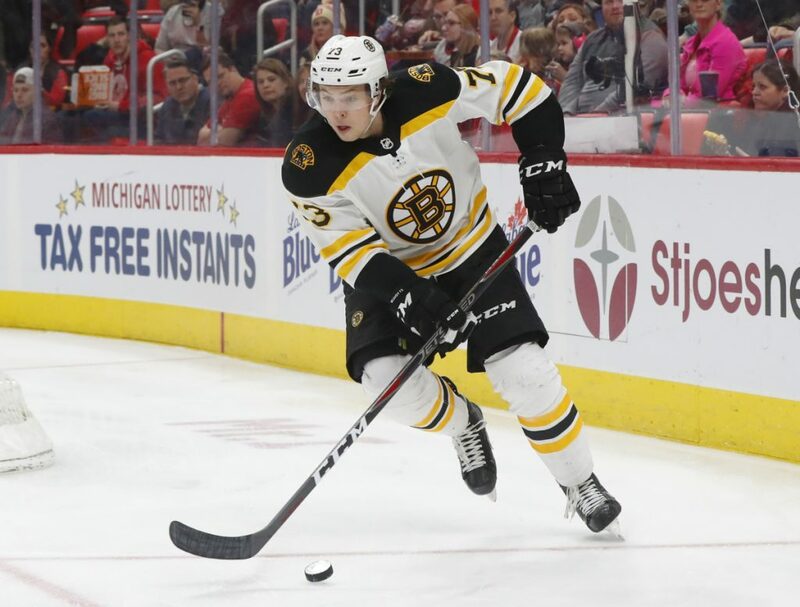 The Bruins will have to fall back on that experience for most, if not all, of the rest of the regular season, with rookie defenseman Charlie McAvoy sidelined for a minimum of four weeks with a sprained MCL in his left knee. He was hurt on the first shift of Saturday’s 2-1, overtime victory over the Canadiens. Losing McAvoy, 20, means the Bruins must replace a top-pairing defender and second-unit power-play point man, whose average ice time of 22 minutes, 6 seconds ranks second on the team and first among NHL rookies. “We’re not going to ask one player to completely replace Charlie,” said Bruins Coach Bruce Cassidy, who moved Brandon Carlo into McAvoy’s even-strength spot next to captain Zdeno Chara, designated several potential replacements for McAvoy on the power play, and moved newcomer Nick Holden, a left-handed shot, to right defense against the Red Wings in Tuesday night’s 6-5 overtime victory at TD Garden. “We’ll be without Charlie for a little bit, but we’ve got lots of depth, and he will be back. I can’t tell you exactly when, but hopefully he heals quick,” Cassidy said. The four-week timeline for McAvoy’s re-evaluation puts the Bruins, all but assured of an Eastern Conference playoff berth and still capable of finishing anywhere from first to third place in the Atlantic Division, into the final week of the regular season. The NHL playoffs begin for some teams on April 11 – about 51/2 weeks from the date of the injury. “Assuming it’s on that time line, he’ll have a little bit of time to get ready before playoffs,” Cassidy said. The Bruins, who Tuesday night began a season-ending stretch of 19 games in 34 days, already knew the remainder of their schedule would be challenging. Without McAvoy (seven goals, 25 assists, plus-26), the test will be more difficult. Boston went 3-1-0 when McAvoy missed four games (Jan. 23-Feb. 1) following a procedure to correct an abnormal heart rhythm. DESPITE THE loss of McAvoy, a right-handed shot, veteran Adam McQuaid was a healthy scratch for the fourth straight game Tuesday, and fifth in the last six. Cassidy indicated that McQuaid, who had to wait for a spot in the lineup after his fractured fibula healed (he missed a total of 36 games), would play soon. “We (play) every second night now, so Adam will get back in the lineup,” Cassidy said. “It could be Thursday (at home against the Flyers); it could be Saturday, Sunday (a home-road set against the Blackhawks). FORWARD DAVID Backes was suspended for three games for a shoulder to the head of Detroit’s Frans Nielsen in Tuesday’s game. The NHL announced the decision Wednesday. Nielsen had already unloaded the puck when Backes drove his shoulder into the Red Wings’ forward, who fell to the ice, left the game and did not return. “In addition to the lateness of the check, what elevates this hit to merit supplemental discipline is the significant head contact that occurs, and the force with which it is delivered,” the league’s video explanation said. That Nielsen was injured was taken into account, as was Backes’ clean record. The suspension without pay will cost Backes $96,774.